Back at the end of the Golden Age, Joe Kubert was looking towards the Prehistoric Age. 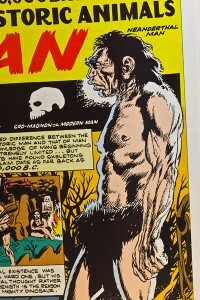 From half a century ago, comes this collection containing One Million Years Ago – the first appearance of the wandering caveman Tor. 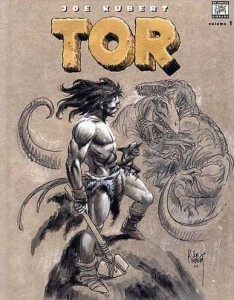 Kubert, not yet the legend he is today for his landmark work on Sgt. 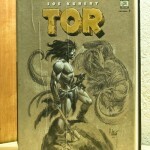 Rock and many DC heroes, first dreamed of Tor’s adventures while on a troopship to Germany. 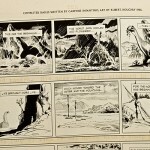 He elaborates on this in his introduction, also mentioning his other big idea – 3-D Comics! While the first 3-D issue he produced (and first of its kind) was of Mighty Mouse, a much more well known character, Tor was the focal point of the second two issues (both numbered “2” due to some strange publishing decisions). 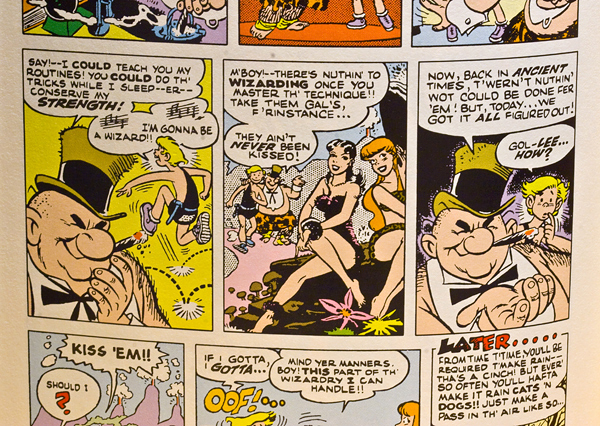 In addition to the noble caveman, there are a variety of one page features, silly cartoon style stories of The Wizard Of Ugghh, and a feature called “Danny Dreams” – where a young boy dozes off in class and has his own antediluvian adventures. 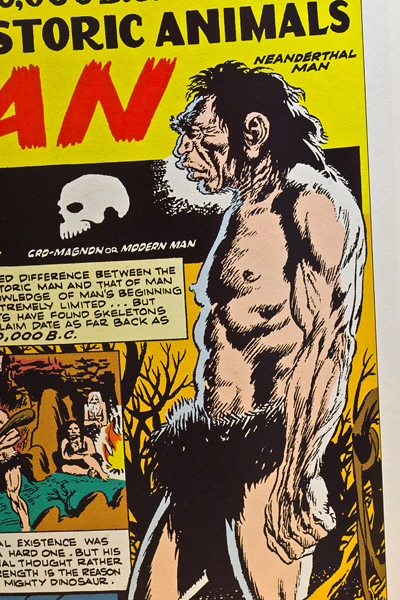 Understandably, there is a lot of history in this volume – both for comic buffs and those who enjoy tales of the primitive world. 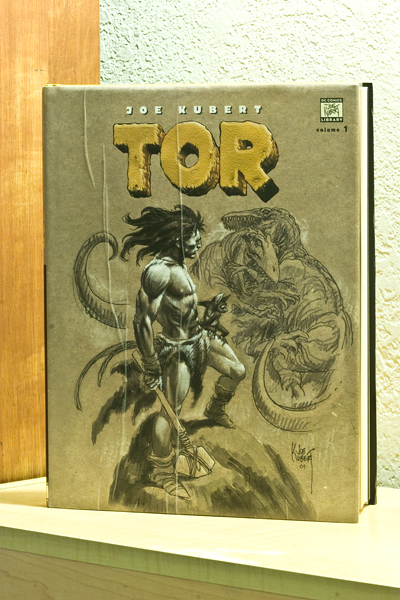 The introductions, both by Kubert and historian Roy Thomas, lend a nice bit of context to the volume and explain the process of creating 3-D sequential art. 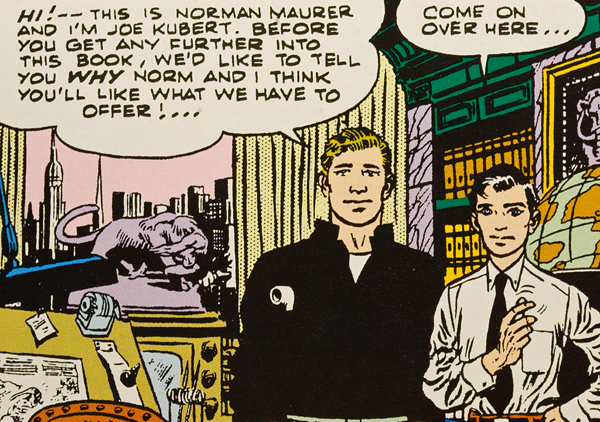 Likewise, the comics themselves contain a rare bit of in-art introduction. 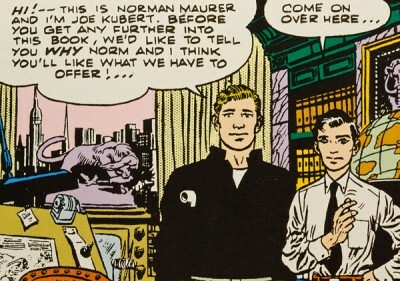 Right after the title page, the first spread is a picture of Kubert and his studio collaborator Norman Maurer – right across from a page of them (drawn near what seems to be the same desk from the picture) introducing the young readers to the age of a million years past. Of course, while comic-Kuburt affirms that “Our job was to search for facts! 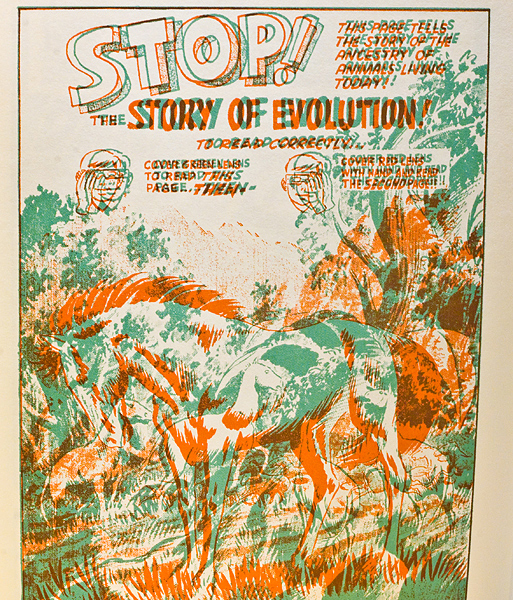 Our work is the product of a great deal of research!” the stories themselves are quite questionable in their presentation of an age conflict between dinosaur and man. Everyone knows that the dinosaurs had already migrated to the Great Valley by the time Humans started adopting comic relief monkey sidekicks. This is the end of the Golden Age, of course, and if the comics weren’t crazy then they would have been doing something wrong. In actuality, Tor’s stories are relatively straight forward affairs – readable, more modern feeling than many works of the time. 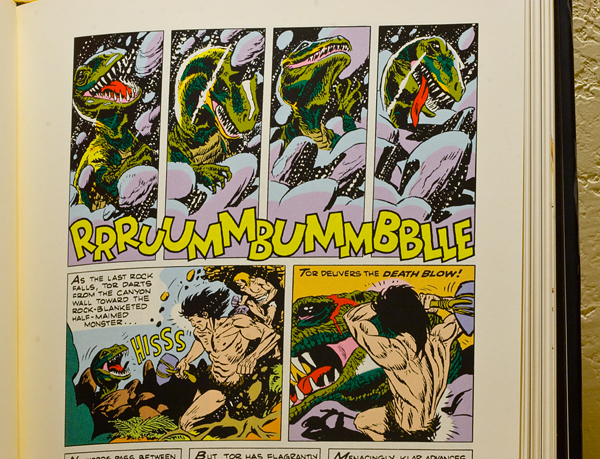 Sure, he cold clocks a fair amount if dinosaurs, and spends most of the book with a chittering – and slightly disturbing looking – monkey creature on his shoulder, but Kubert’s understanding of facial expression and body language brings most of the stories together beautifully. 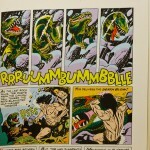 The writing may have the marks of the period when it comes to punctuation and grammar, but the art is mature – these are fully realized figures, sequential art reaching its potential. Perhaps not too deep (still stories for children) but thoroughly enjoyable. The Wizard of Ugghh stories show their age a little more. The drawing is right on for what it attempts to be, the expressions and mannerisms perfectly relatable, but the style feels more like a house style – the same as many other cartoony works, without the passion for detail and form that drives the Tor stories. They’re fun, but the punchlines don’t always make sense and the jokes are often unsatisfying since they rely on just being silly more than a twist of logic, word, or plot. Fun, perhaps, but not essential. 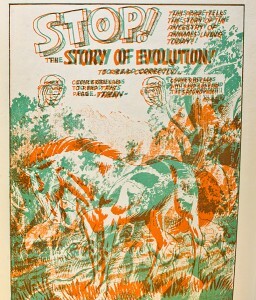 If anything, they give the rest of the book even more context – this kind of cartoony work was very common in the early 50s. 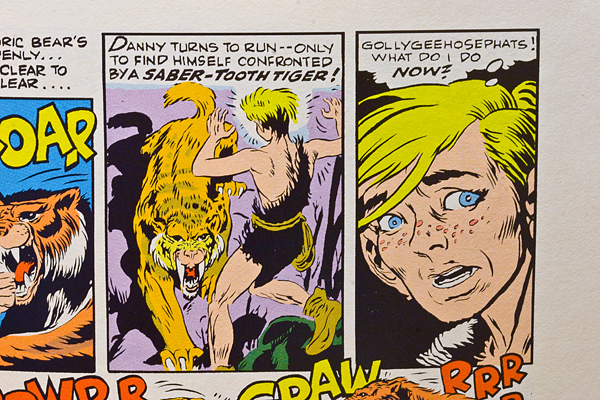 Finally, the Danny Dreams stories are something else. On the surface it’s pretty simple wish-fulfillment stuff – “Kid Like You Goes Back In Time!” – right down to the end of every story – “And It Was All Real!” Something about it, though, felt darker, strange. 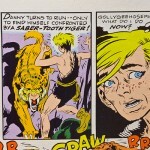 The art style is closer to the “serious” Tor stories, with Danny’s fear and confusion oozing from his expressions. It seemed that he wasn’t having fun adventures, he was on the verge of a terrifying death due to some unexplainable transportation. His contributions, also, were they really changing time? How did his early inventions ripple outward? I’m reading into it a lot, I know, but only because the stories leave themselves open in this way. 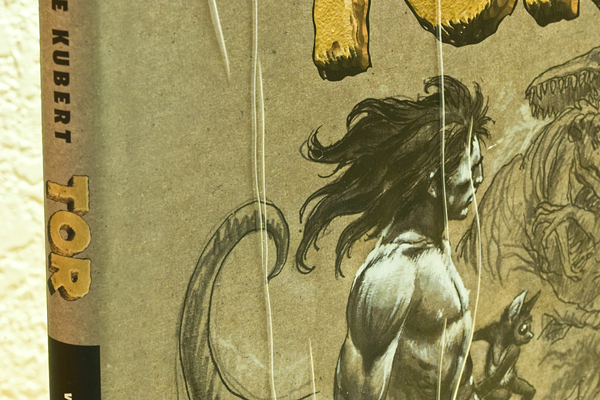 It’s just a marketable shtick, but in Kubert’s hands it can’t help having some strange undertones. 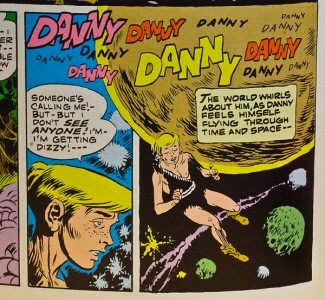 By the end of this book, I found myself hoping some future creator would pick up Danny Dreams and run with it – the stories would need to be expanded and really go somewhere, instead of repeating the same basic plot structure, but I can imagine the consequences of this dream travel to be very dramatic. Finally, some notes about presentation. 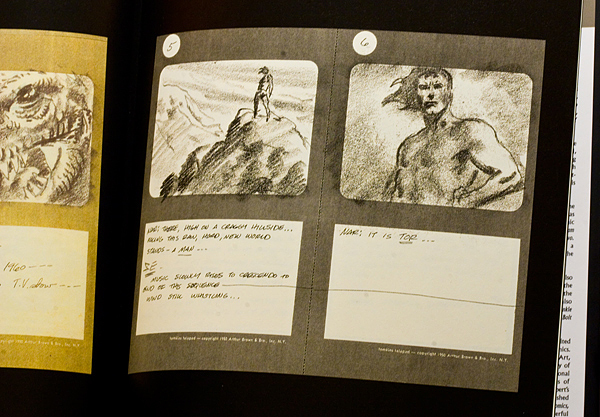 All of the contents have been restored with care – the digital coloring here is true to the original intentions and feels mostly seamless. 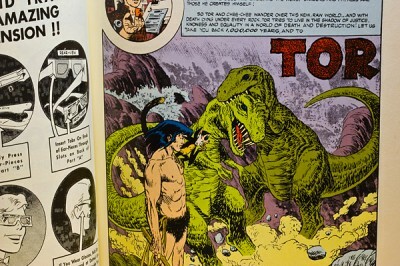 The 3-D issues, while reprinted here in color, are interesting for their exaggerated foreshortening and spacial tricks – it’s easy to imagine how they originally must have looked.There are a couple page spreads that still have the Red/Green effects on them, since they used it to display two drawings at once. 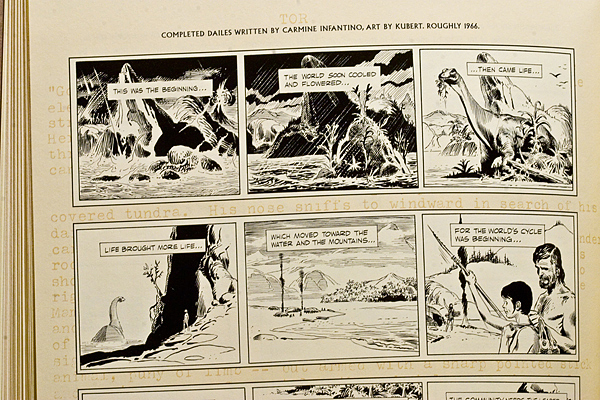 It’s worth mentioning that many of the one page features, instead of being throw away page filler, are beautifully crafted drawings of dinosaurs and other denizens of antiquity. I found myself flipping back to them. In addition to the two introductions, there’s a lot of extra content in the back. The sketchbook features promos for a possible tv project, 13 pages of storyboards, 6 penciled strips by Kubert, 12 fully inked daily strips written by Carmine Infantino, and a variety of other related notes. It’s good stuff and helps round out what is otherwise a bit of small volume, especially for a hardcover. The book is slightly wider and taller than your standard hardcover and it’s obvious that DC intends for this series to appeal to Archive collectors, but most of those volumes are usually a lot thicker. I managed to get all three books for 20 each on ebay, but they all suffer from a small printing issue: the dust covers have wrinkles on them from the lamination. Besides that, they’re beautifully bound, but it seems that the wrinkle problem was very common with these books. I didn’t think it impacted my experience in any way, though, and I’m proud to have them on my shelf. Great! A chunk of history. If the price tag and possible cover wrinkles don’t scare you, I fully recommend it. 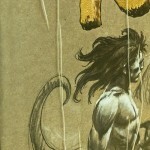 This is the very first item on our DC list and is a good comic entry point. But you might want to read other Kubert works first – like his much more widely known war stories starring Sgt. Rock. Tor Vol. 2 of course!